Head of the Academic Choir Department of the School of Arts at the St. Petersburg State Institute of Culture, artistic director of the Concert Choir of the Institute of Culture and the Women’s Choir of the St. Petersburg Rimsky-Korsakov Music College, member of the Union of Composers of Russia and the Union of Concert Musicians of St. Petersburg, artistic director of the «Singing World» International Choral Festival (St. Petersburg), winner of the St. Petersburg Government Prize for culture and art, award winner of international contests, professor. 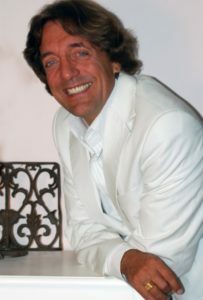 Author of choral and orchestral compositions, instrumental and vocal ensemble music, sacred and secular a cappella music, vocal cycles, piano and choral pieces for children, original soundtracks music for theater performances, arrangements of Russian folk songs for the choir, popular tunes, romantic and pop songs. Since 2012 he has taught at the Department of Choral Conducting of the St. Petersburg Rimsky-Korsakov State Conservatory, from 2017 – at the Department of Choral Conducting of the Institute of Music, Theater and Choreography of the Russian A.I. Herzen State Teachers’ University. 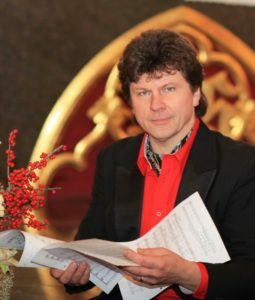 S. Ekimov has repeatedly given master classes in choral music of the 20th – 21st centuries serving as a member and chairman of the jury of various choral and composition festivals and competitions in Shanghai, Florence, Venice, Rimini, Bratislava, Kaunas, Olsztyn, Tallinn, Daugavpils, Almaty, Aktobe, Minsk, St. Petersburg, Moscow, Sevastopol, Vologda, Pskov, Yekaterinburg, Kazan, Saratov, Novosibirsk, Magnitogorsk, Orenburg, Kemerovo, Barnaul, Chita, Yoshkar-Ola, Vladivostok. S. Ekimov performed at concerts in St. Petersburg, Yerevan (Armenia), Magnitogorsk, Syktyvkar (Komi Republic), Nizhny Novgorod, Yekaterinburg, Kazan. Choral compositions by S. Ekimov are on the repertoire of leading choral groups in Russia, recorded on CDs, broadcast by radio and television, and are published in the homeland of the composer and abroad. They have been performed in many cities of Russia, as well as in Armenia, Latvia, Lithuania, Estonia, Ukraine, Belarus, Poland, Hungary, Austria, Germany, France, Spain, Holland, Switzerland, China, Taiwan, South Korea, USA and Japan. Professor, Jāzeps Vītols Latvian Academy of Music, the artistic director of WCG 2014 and ECG 2017 in Riga, principal conductor of the internationally awarded Latvian University female choir named “Minjona“, principal conductor and artistic director of Jāzeps Mediņš Music School boys’ choir, chief conductors of the All Latvian Song Celebration (in 1993, 1998, 2001, 2003, 2008, 2013 and 2018) and the Youth Song Festival (in 1995, 2000, 2005, 2010, 2015). 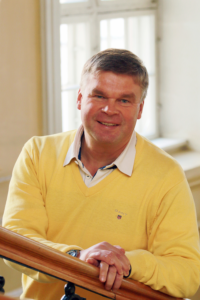 Since August 2014 Romans Vanags is an Artistic Director of INTERKULTUR (Germany) organization and also chairman of the Latvian choral conductors’ board. In 2008 received the highested civil decoration in Latvia — the Three Star Order. 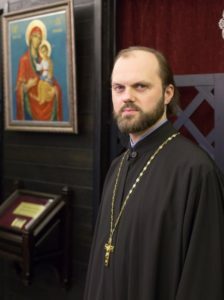 Chairman of the Council for Culture of the St. Petersburg Diocese, First Deputy Chairman of the Department of Religious Education and Catechesis of the St. Petersburg Diocese; Associate Professor of the St. Petersburg Theological Academy, Candidate of theology. Associate Professor at the Vytautas Magnus University (VMU) Music Academy (Kaunas); since 1998 the chief conductor of World Lithuanian Song Celebrations; Artistic director and conductor of church chamber choir “Cantate Domino”, VMU Academic choir “Vivere Cantus”, VMU Music Academy choir and the choir “Cantica”; Lithuanian choral expert – advisor. He is Artistic director of International Choir Festivals and Competitions cycle «Lituania Cantat». Member of the jury of national and international competitions. 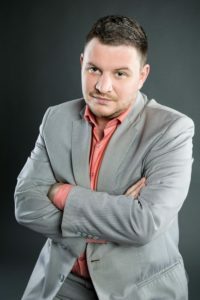 In 1998, the Ministry of Culture of the Republic of Lithuania provided this artist with the 1st degree S. Šimkus award, a winner of “Authentic music” award (2008), “Golden bird” award for nomination of “International shine star” (2009), was awarded the Kaunas City Municipality Culture and Art Prize (2010) and the city of Kaunas burgomaster Jonas Vileišis. Musical Director of the National youth choir, the Paris women’s Quartet and the new Sorbonne choir, he has been coordinating 76 Paris College choirs for 15 years and is William Christie’s assistant in 1995. He is currently the artistic director and conductor of the Variatio choir, Choir of Nicolas de Grigny and the Allegri soloist Ensemble. The member of the jury of international competitions and conducts master classes both in France and abroad (Israel, Slovenia, Russia, Estonia, Portugal, China). In 2007 the choir Nicolas de Grigny under the management of Jean-Marie Poissan and the Orchestre national de Lorraine under the direction of Jacques Mercier was awarded the national prize of France’s «Golden tuning fork». Jean-Marie led the international choir at the outstanding events held at the stadium of France: Opera J. Verdi «Nabucco «(2008)» Aida » (2010) and the show Rolling Stones (2014). Artistic Director and Chief Conductor of the Chamber Choir of the Moscow Conservatory, Tula State Choir; Dean of the Department for Foreign Students’ Affairs, member of the Academic Council, Professor of the Department of Choral conducting of the Moscow State Conservatory named after P. I. Tchaikovsky and the Moscow State Institute of Music named after A. G. Schnittke, Art Director of the Moscow Conservatory festivals. The official representative of Russia, a member of the World Choir Council «World Choir Games» and the jury of the choir competitions of the international association «Interkultur». Co-founder and chairman of the jury of the Open Contest of Young Musicians «Vivat Musica!». The member of the Moscow Musical Society and the International Union of Musical Figures, the Union of Composers of the Russian Federation, and the All-Russian Choral Society the main guest conductor of Educational Bridge Project Festival Choir (Boston, USA), guest conductor of Taipei Philharmonic Chorus (Taiwan / China); member of the Committee on Intellectual Property of the Chamber of Commerce and Industry of the Russian Federation. 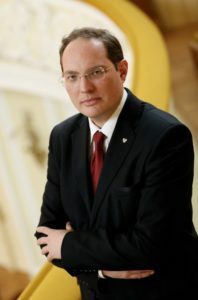 Alexander Solovyev was awarded a grant from the President of the Russian Federation in the field of culture and art; was awarded the title of laureate of the Moscow City Prize in the field of literature and art in the nomination «Enlightenment Activities», was awarded the Prizes of the Ministry of Defense of the Russian Federation in the field of culture and art in the nomination «Cultural and Educational Projects». Among the awards is the title of Master of Chorus and Honorary Member of the Association of Choir Directors of Croatia, etc. Director and teacher of «St. Petersburg music and pedagogical college», from 2012-2017 — conductor of the choir of the state academic chapel of St. Petersburg. 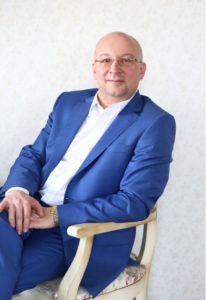 Artistic Director and Chairman of the organizing Committee of the St. Petersburg open competition of conductors of children’s choirs named after P. A. Rossolovsky, international vocal and choral competition «The voice of Youth». Member of the jury of competitions and festivals. Member of the state attestation commissions. Guest conductor of choral festivals for the day of Slavic writing and culture 2016, 2018. Lecturer of professional development programs.